This is my favorite piece of prophecy about the Messiah. These are words that I have known for so long that I can’t remember how or when I learned them. I know these words so well they have become part of me. 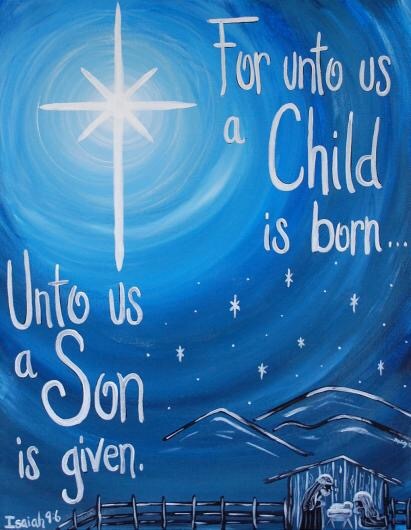 They are part of how I understand this time of year, how I celebrate the baby born in Bethlehem, how I understand who Jesus was and is and always will be. Wonderful Counselor – because he would teach in ways that would inspire people for thousands of years after his death; because he would speak words that would instruct; because his stories would open eyes and inspire poetry; because his words are the way to life that outlasts death. The mighty God – because his sacrifice and resurrection would break the bonds of sin and death FOREVER; because when he died, the veil would tear and there would no longer be separation between God and humanity; because with a word, with a thought, he could heal the wounded, cure the sick, give sight to the blind and set the captives free. The everlasting Father – because his reign would never end; because he adopts us as children and fathers us forever; because he has gone to prepare a place for us so that we can be with him forever. The Prince of Peace – because when we chose to walk in his ways, we find peace within ourselves and peace to give to others in need. All this, wrapped in a fragile, pink, chubby, tiny, beautiful infant package. Because God chooses to make himself vulnerable for us. Because in humbling himself, God showed us the depths of his love for us. Because God wants us to know that we are not – not ever, not for an instant – alone. Because God chose to become one of us in order to lead us…to love, to hope, to forgiveness.